Instead of starting from scratch and building new search criteria for each property widget, IDX Broker allows you to copy the search criteria from an existing search into the widget to use the same criteria. This can be a huge time saver. Here's how it's done. NOTE: If you don't have any existing Saved Links, you should be using a Custom Search widget. To copy the search criteria from a Saved link, navigate to Design -> Website -> Saved Links. Make sure that you have the Search Criteria tab selected and then click the View Results in New Window button. Select the entire url from the address bar and copy it. Once you have the link copied, you can paste it into a text editor or keep it in your clipboard and navigate within the IDX Broker dashboard to Design -> Website -> Widgets, then click Create New in the upper-right hand corner. 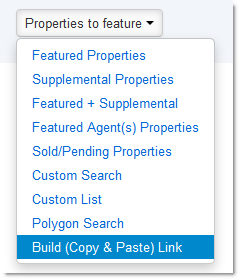 Select the type of widget you would like to create and then select "Build (Copy & Paste) Link" from the Properties to Feature drop-down. Once you've set the criteria of your search, you can finish the last steps of sizing and naming your widget. When you are done, simply Build Widget. Remember that you can always come back and edit the widget at a later time to customize it further.